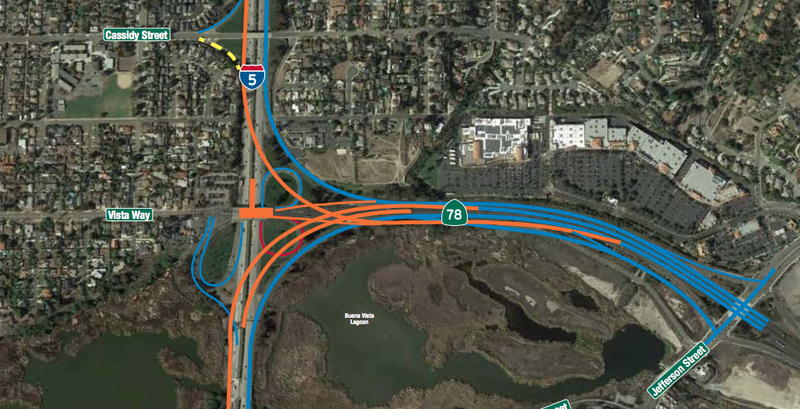 If you’ve been following the planning of the widening of I-5, specifically the I-5/78 interchange, you know it’s hurtling into our neighborhood faster than any speeding car, truck or van on the I-5 freeway. There have been several conversations with Cal Trans and there are still many open questions. We’ve been following the discussion from both the South O Residents Association and Shari Mackin on nextdoor.com and want to share some of the highlights (or lowlights, depending on your outlook). But to stay up to date, be sure to either follow the updates on nextdoor.com or sign up for alerts and info by signing up on the google form here. Cal Trans has received well over 100 comments during the community meeting in Carlsbad. They are still reviewing/studying the comments which will lead them to the project/s they will present to study at the Scoping Meeting which she states will be held in late May or early June 2015. CalTrans will continue to accept and review public comments/input regarding which alternative/s they will study. According to CalTrans, comments continue to “trickle” in. Please note, added to the scenarios is a NO BUILD option. Our representative to SANDAG (Mayor Jim Wood) and Alternate Council Member Chuck Lowery) should be able to work with CalTrans to have the meeting in Oceanside. Categories: City Meetings, News | Tags: Expansion, Hwy 78, I-5, Oeanside | Permalink.